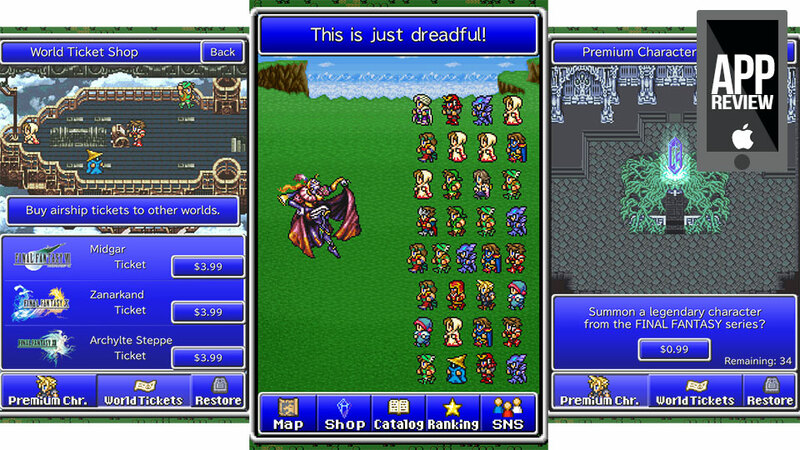 If you're looking for a mildly interactive trip through the history of the Final Fantasy franchise and don't mind shelling out a little more than $50 for the complete experience, Final Fantasy: All the Bravest might be a justifiable purchase. If you're just in it for the gameplay you can save a lot of time and money by pulling up this video and rubbing your monitor. What if all the character classes from the sprite-based Final Fantasy games formed a massive mob to tear through seven years of adventure in a single sitting? That's the concept behind All the Bravest. Alternating between lightning random encounter rounds and boss battles, players roll through once-massive storylines in rapid-fire fashion, their army of generic characters representing classes (jobs) culled from throughout Final Fantasy history expanding with each level gained. Counting extra slots gained through regular sharing links to the game on social networks (a devious tactic), the player's party can grow to hold up to 40 characters — 40 characters they have almost no control over whatsoever. There is no party management here — the game dictates the composition of the sprite horde. This leaves the player free to participate in battle, and by participating I mean rubbing the screen furiously while action meters refill. It takes a simple touch to send one of the troops against the enemy, and with no real strategic value to holding characters in reserve battles are nothing more than fervent finger sliding marathons. Some early reviews of the game on iTunes liken battles to an interactive screensaver — that's not far off. The sheer mayhem and spectacle of it all is a joy to behold, but I can behold just as well without having to spend money or awkwardly stroke my iPad display. Much more interactive is the ability to pay for all the things. At this point I've come to grips with the fact that Square Enix can't release a game on iTunes for under five dollars that isn't positively packed with opportunities to purchase more content, so when I saw the $US3.99 price tag for Final Fantasy: All the Bravest I was fully prepared for that number to rise exponentially once I started playing. The company did not disappoint. The game gets an early start asking for cash via the party renewal system. During battles enemies attack at regular intervals, steadily decreasing the number of characters in the party. Should all characters perish the player has two options — wait until they respawn at a rate of one every three minutes, or spend $.99 on an item that instantly brings all characters back to the battlefield. Actually there is a third option — back out of the battle and try again with a full party — but this option isn't well-documented and many angry iTunes reviewers stopped playing before discovering it. The payfest continues with premium characters — 35 big names from Final Fantasy history that will bring their powerful abilities to the player's party for $.99 apiece. Drop a dollar and the game randomly delivers Cloud or Yuna or any of the other premium characters. There is no way to pick and choose. You've just gotta keep paying until the one you want shows up. As an added bonus, these premium characters are automatically assigned to party slots, so if you unlock a character you don't like, tough. What are we at now, $4? Figure in the option to unlock additional adventures through Final Fantasy VII, X and XIII for $4.49 a shot and the grand total comes to just under $52. For $52, Final Fantasy: All the Bravest delivers an abridged tour of some of Final Fantasy's finest moments and a chaotic explosion of iconic pixel art, all set to wonderful music that's inspired a generation of role-players. Its strength is nostalgia — nostalgia supported by enough spectacle to distract potential investors to the fact that most of the memorable content can be had elsewhere without spending a single penny on in-app purchases. As I said yesterday, the in-app purchases make this a no buy for me. It's always worth taking a look at those before buying an app, or even downloading a 'free' one. SE please... GET BACK TO TELLING THE STORIES WE ALL LOVE!! Yeah it's such a shame SE is looking at quick $$ as opposed to trying to fortify customers for life with decent titles that the fans are willing to give them feedback for free and that they don't even listen to. I have over 100k gil now and no way to spend it... the game doesn't give an option for spending gil. Why put gil in the game if there's nothing to spend it on?